Does your garage look a little like a dungeon? 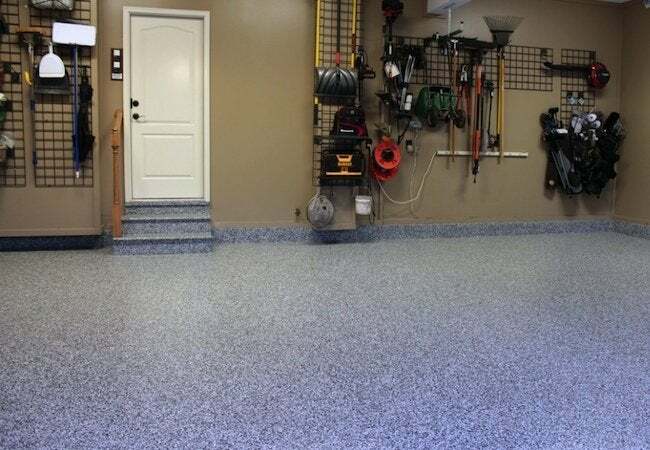 Coat the floor with colorful (and highly durable) epoxy paint. Here's how. Looking to make your garage a little snazzier? Dressing up the concrete floor with colorful epoxy paint may be just the ticket. Besides looking sharp, epoxy resists grease and oil. Plus, it’s easy to clean. As with any paint job, preparation is key. First, wait for mild weather. Epoxy doesn’t bond well in extreme temperatures. Next, remove any existing paint. Use a degreaser to clean up oil stains, then an electric scrubber to clean the whole floor. Wet vac the floor to get up as much water as you can, then sprinkle a mix of muriatic acid and water on the floor and go over it again with the scrubber. You’ll need to apply at least two coats of epoxy. Be sure to allow plenty of time between coats. And don’t forget to wear protective gear during the job, as epoxy fumes can be toxic.